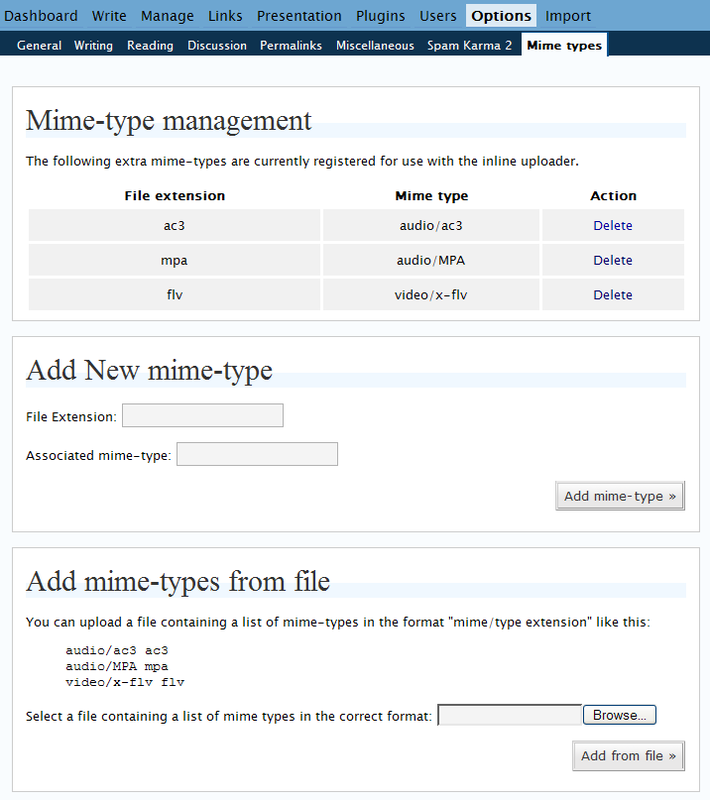 As ever the plugin adds a new options page as Options … Mime-types which allows you to add/delete the extra mime-types. Made a list with 386 Mime-types. In case it is usefull for someone. I’ve tried to use v0.90 with WP 2.2.1, and it failed to register reg (Windows registry) files properly as text/plain. Now the reported MIME type is MP3. Is there any way to fix this? In the admin panel you can delete individual entries. Therefore you should be able to delete the entry for .reg files and then create a new one that is correct. I tried deleting all MIME-config entries, and the file itself, and then upload the file again. It didn’t help. It’s still downloaded as an MP3 file. I also tried changing functions.php (to include “reg” with the text/plain formats), and uninstalling MIME-config before uploading again, but it seems to be completely broken. Any tips would be great.